Regions are difficult to govern – coordinating policies across local jurisdictional boundaries in the absence of a formal regional government gives rise to enormous challenges. Yet some degree of coordination is almost always essential for local governments to effectively fulfill their responsibilities to their citizens. State and local governments have, over time, awkwardly, and with much experimenting, developed common approaches to regional governance. In this revolutionary new book, authors David Miller and Jen Nelles offer a new way to conceptualize those common approaches: Regional Intergovernmental Organizations (RIGOs) that bring together local governments to coordinate policies across jurisdictional boundaries. RIGOs are not governments themselves, but as Miller and Nelles demonstrate, they do have a measure of political authority that allows them to quietly and sometimes almost invisibly work to further regional interests and mitigate cross-boundary irritations. 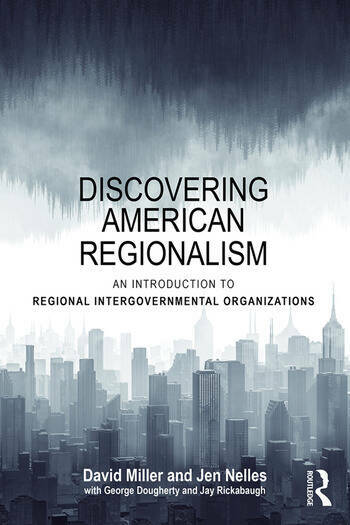 Providing a new conceptual framework for understanding how regional decision-making has emerged in the U.S., this book will provoke a new and rich era of discussion about American regionalism in theory and practice. Discovering American Regionalism will be a future classic in the study of intergovernmental relations, regionalism, and cross-boundary collaboration. David Miller is Professor of Public Policy and Management at the University of Pittsburgh’s Graduate School of Public and International Affairs (GSPIA), USA. Jen Nelles is Visiting Associate Professor in the Department Urban Public Policy at Hunter College (CUNY), USA.